The launch of the Apple News+ subscription has resulted in Apple preparing for the closure of Texture to all users, a move it will be performing on May 28. While terms of the deal have not been disclosed in the time since the purchase, it is believed in one report to be at or above the value of $485 million. According to sources of the New York Post, the $485 million included an up-front payment of $100 million collectively to publishers Conde Nast, Meredith, Hearst, and Rogers in Canada, as well as venture backer KKR. On top of the first payment, the deal also allegedly provides the publishers with a minimum of $145 million in the first year, followed by at least $240 million in the second and third years. It is unclear exactly how the money will be split between all parties. 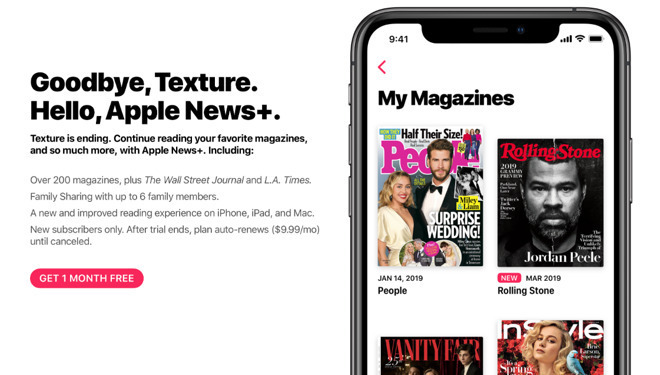 Apple is currently in the process of trying to convert current Texture users over towards Apple News+, its $9.99 per month subscription service, before the app closes its doors. While current user counts are unknown, it is thought Texture had around 240,000 subscribers at the time of the March 2018 purchase. Of that figure, 30 percent was believed to be made up of Windows and Android device users, customers who must switch over to Apple's platforms if they wish to subscribe to Apple News+, due to a lack of apps for other mobile operating systems.